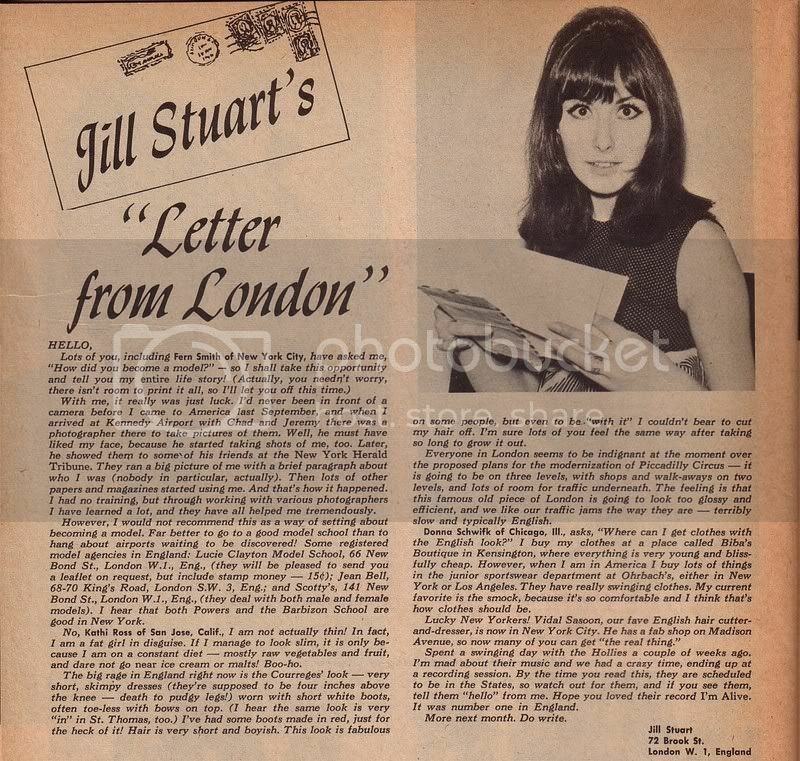 Here's a column written by Jill Stuart, wife of Chad Stuart of Chad and Jeremy called "Letter From London." It was a beauty and advice coulmn featured in 16 magazine, a popular periodical for teenagers in the United States. It's still being published, though now you will find pictures of the overrated and undertalented pop acts of today polluting its pages! Jill also talks about modeling schools and where she buys her clothes in London and New York. Sorry to our British readers, but Ohrbach's doesn't exist anymore! 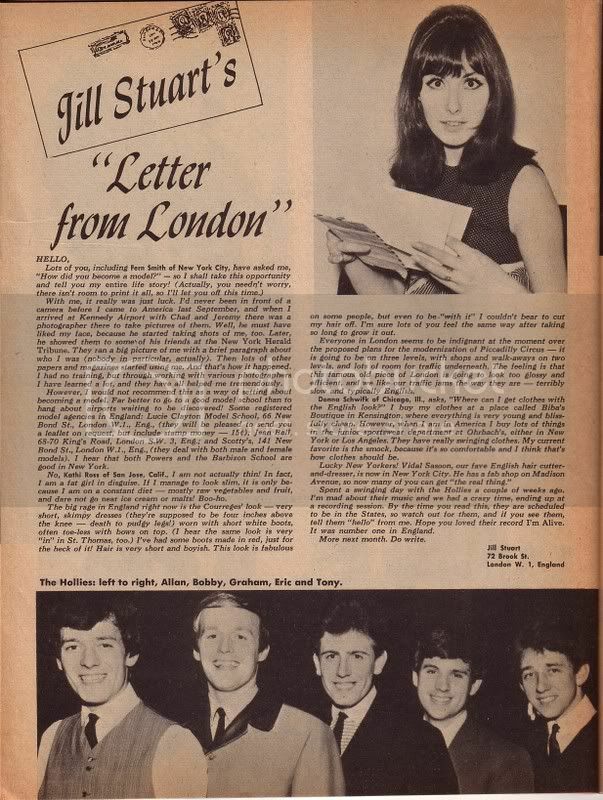 This coulmn doesn't say much about the Hollies in general, except that Jill hung out with them in London and talks about their number 1 hit at the time, "I'm Alive." Plus, there's a cute photo of them at the bottom! The scan may come out a little hard to read, but you should be able to if you look at it closely. Here are larger scans of the text and photo. Vrinda ,sorry it's taken me so long to respond to this article The picture is one of the best pre 1966 pics I have seen of the boys.They look so happy and friendly.Imagine spending a day with the boys and ending up in the recording studio(I'd be pretty good as a backing singer,honest I can hit all the high Nash bits)Anyway thanks again,Allan as usual looks amazing . Anytime, Paula! That is also one of my favorite photos of them with the origial lineup. Allan is gorgeous, as always, and I love the smiles on all their faces. Even Eric looks adorable here. I never saw him smiling that much before. I wish I could have hung out with the boys in the recording studio. If Bobby needed help with the percussions - like the maracas, tamborine, or bongos - I could bang away at those! I could also sing harmony with Allan and Graham ... WOW! Antyime, Paula! That is also one of my favorite photos of them with the origial lineup. Allan is gorgeous, as always, and I love the smiles on all their faces. Even Eric looks adorable here. I never saw him smiling that much before. I wish I could have hung out with the boys in the recording studio. If Bobby needed help with the percussions - like the maracas, tamborine, or bongos - I could bang away at those! I could also sing harmony with Allan and Graham ... WOW! I do agree with you it is a really lovely pic of Eric,very natural.If we were in the recording studio the producer would have to cut out a lot of heavy breathing and sighing . That is, if he allowed us to stay there after all that! I don't think I would be able to keep from staring in awe at Allan all the time! Our eyes would be as large as plates . I can only imagine how Allan would have felt! I think he would very nicely smile at us ,shake our hands,turn around and RUN . I wouldn't blame him. I'd like to see how fast he goes. He'd probably run through the wall! Since the female contingent here is drooling of the way the lads look in this and other threads (I'll never think of a guy in swimming trunks quite the same way again), it's worth noting that the lovely Ms. Stuart is likely more attractive to men than any of the Hollies were to gals. It's a great way to spice things up! As my psychology professor once told us, "You can't really compare a girl to a guy in appearance." While Ms. Stuart is indeed a lovely young lady, her fanbase is, at this moment, outnumbered by the number of gals here who find the Hollies attractive. On top of that, given the amount of attention both Jill and the Hollies got was not as much as some of their counterparts at the time, they most likely did not get as many guys and gals fawning over them as they should have, respectively. I agree with you about the swimming trunks, though Sparty: I'll never think of a guy in swimming trunks the same way again, either! I'll keep having visions of Tony in pinstripe blues!